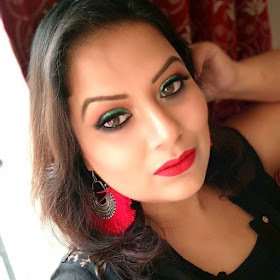 After we talk about MAYBELLINE POWDER MATTE lipsticks , it's time to share my experience using another new launch of lipsticks of Maybelline. Yes, you guessed right I am going to talk about MAYBELLINE NEW YORK COLOR SENSATIONAL CREAMY MATTE LIPSTICK. Price: - Rs.575/- for 4.2g. Additional Information: A world famous renowned brand, Maybelline New York is known for its scientifically-advanced makeup formulas, revolutionary textures and up-to-the-minute, trendsetting beautiful makeup products that are affordable and make you look effortless and stunning. With Maybelline, it's all about empowering women to make a statement and explore new looks each day! The lipsticks packaging is almost similar to those Powder mattes one. It comes in a semi-transparent cap matching with the lip color of the lipsticks. The silver glossy case and the semi-transparent cap actually create a classy combo packaging of these lipsticks. There are 13 beautiful shades in this creamy matte range in which I picked up two flattering neutral lipsticks. The two lipsticks I picked are N*DE NUANCE and TOUCH OF SPICE. In this entire range of 13 shades, TOUCH OF SPICE is the most selling lip shades that I managed to grab. The lipsticks are quite pigmented. The texture of the lipsticks is satin which means slightly creamy. On dry lips, it will turn comfort matte actually. These lipsticks do transfer a bit leaving light marks on cups and glasses. They don't tug or pull my lips during application. It does tend to bleeds a bit from the corner of the lips if we have any oily meal. The bleeding of lipsticks from side corner of lips can be managed by using a proper lip liner. The lipstick stays pretty 4 hours on my lips. These lipsticks are not moisturizing but hydrating on lips. Overall I am liking these lipsticks on these hot and dry weather of Noida when my lips feel super dry. These lipsticks are actually a good option for a budget friendly lipstick lover. Did you pick up any lipstick from this range?